The charity Care 4 Calais has been working for more than three years to provide basic necessities to those who are destitute in Europe, having fled conflict and unsustainable lives. I have been a regular visitor to some of the ad hoc camps in France since December 2015. After the Jungle in Calais was dismantled in 2016 many of the inhabitants went to Paris. 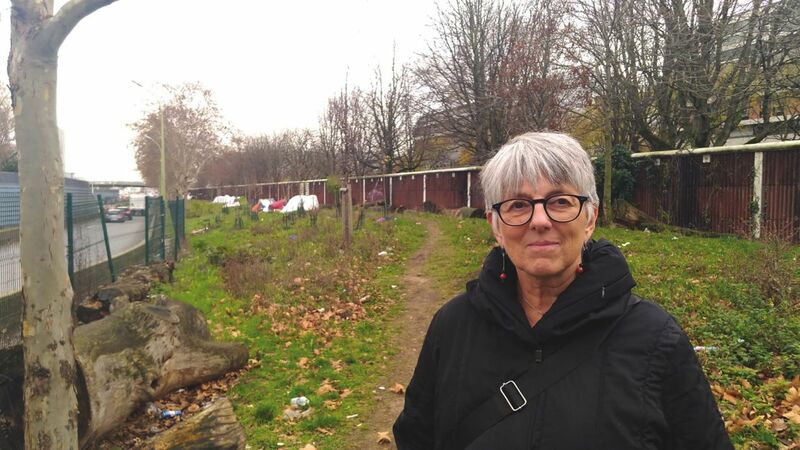 As part of Care 4 Calais’ winter campaign I took my staff to Paris to meet Danica Jurisic, who works on the ground helping people to find food and shelter, to access education and healthcare, and to navigate the asylum process. The camps themselves are scattered around the city. This Christmas saw a significant rise in the numbers of people making the dangerous journey over the channel to reach safety in the UK. As I have seen on each visit to the camps, they can barely be called habitation. Considering the conditions that those seeking safety are forced to endure on reaching Europe, it is not surprising they are willing to make such desperate journeys on the open sea. Those forced to sleep outdoors select locations where they are not likely to be evicted. Jurisic explained that the first camp we visited offered the inhabitants good escape routes should the police attempt to remove them. Other areas are chosen due to the shelter they offer from the weather, for instance under bridges or near public buildings. The lack of adequate shelter was highlighted by a small pile of sodden blankets and clothing strewn across the mud near one of the camps. Following torrential rain, several tents had leaked, causing the contents to become saturated. Living outside in the winter means that clothing cannot be dried and has to be abandoned. The most striking thing about the camp locations is that none offer any privacy. Those camping are always on public land and always in the public eye. Unlike people with homes, they cannot shut the world out and take time to relax. They are constantly on guard in case their space is invaded. The conditions are poor. One camp we visited was infested with rat holes. Meanwhile, families with children trying to sleep underneath the canopies of shops were being sprayed with water by a municipal cleaning vehicle, soaking their blankets and shoes neatly arranged by their beds. Visiting those forced to live outside highlights the destitution that is being suffered. Those in the camps rely on the work of charities to meet their immediate needs. Some food is provided by local organisations and Care 4 Calais works to bring clothing and other goods into the camps. This year, it is running its Coats 4 Calais campaign again, seeking to collect winter clothing for those forced to sleep outside in the freezing weather. A shocking detail in some of the camps we visited is the presence of children and families. Prior to asylum applications being processed, families are left to sleep outside. It was awful to see young children so vulnerable and exposed, with no warm, safe place to lay their heads. A charity in Paris tries to organises placements for families who will otherwise be left outside through the night. This sadly means that families must often wait all day, unsure of whether they will be provided shelter for the night. Jurisic said this situation was terrible for the children involved. For her, it amounted to “psychological abuse” due to the instability it causes in their early years. She said: “Every night, families with small children, isolated women and minors are waiting in the cold in hope for temporary accommodation, a one-night bed. If they are lucky, they will be taken to a home of a volunteer, where they will spend the night and, in the morning, return to unofficial camps.” The constant moving and stress caused by this situation, she felt sure, would emotionally harm people at such a young age. It should be remembered that those who find themselves stranded in France and elsewhere in Europe have often fled harrowing situations in their home countries. Many are fleeing war, harassment, political persecution, economic deprivation, floods, drought and famine. Those stranded are generally skilled and adept individuals who could flourish and contribute to human society. Instead, they are left in Europe, without shelter and dependent on the goodwill of charities like Care 4 Calais. Europe has seen large numbers of people arriving, hoping to restart their lives within the safety of European states. Visiting the camps in Paris suggests that the response of many European governments has so far been inadequate. As an MEP for the North West, constituents write to me frequently to express their dissatisfaction with the conditions people are forced to endure upon arrival in Europe. I know that most of us do not want to see fellow humans living in these conditions. I will always use my voice to highlight the need for more support for those stranded on our streets, and also to call for the UK government to step up and share the global responsibility of tackling the refugee and migrant crisis on a par with other countries such as Germany, Sweden, Spain, Canada, Jordan and Lebanon. Meanwhile, I am proud that my staff rolled up their sleeves to help organise collections for Coats 4 Calais from generous people and organisations across the North West. Thanks to each and every one who donated. The campaign will continue all winter so please spread the word.